Mats are nasty entanglements of hair that may involve the topcoat, undercoat, dirt, burrs, loose hair hanging around, and just about anything your dog may have gotten into. Because they can be quite damaging and even painful for your dog, mats need to be removed. Once you get into de-matting, you will find many tools and products on the market that you may choose to try. Experiment to see what works for you, and analyze each product to learn which ones might be best for your dog's coat. If you have acquired a dog through a shelter or rescue that is severely matted, to avoid further stress on the dog the best course of action is to consult a professional, and most likely have the dog shaved to give its coat a fresh start. When it comes to actually removing a mat, there are differing opinions about whether the coat should be bathed first. Some argue that water tightens a mat, making it more difficult to deal with. 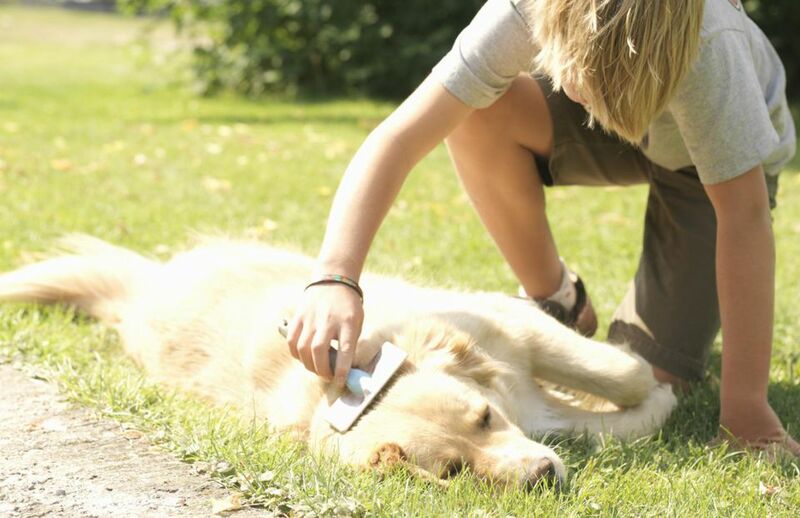 Others claim that a clean and conditioned coat is easier to handle, reasoning that the hair will be softer, come apart more readily and be less likely to suffer damage from the abrasive effect of dirt in the hair. Experimentation may be the only way for you to decide the proper course of action. If you choose to bathe your dog prior to de-matting, apply the de-matting/detangling product first, let it dry, then follow with the bath and a high-quality leave-in coat conditioner at the end. Whether you bathe your dog first or not, there's a simple process to fix smaller mats on your dog. Section the dog's hair to make it easier to locate the mats. Don't forget to inspect its paws, as this is a common hiding place for mats and a very sensitive area for your dog. Also, check under the "armpits" and along the inside of the legs. Pretreat the mats with detangling/de-matting spray and let it sit for about 20 minutes or so, to really penetrate the hair and begin the softening process. After this has soaked in, use your fingers to work with the matted hair from the outside in, gently easing it apart a little bit at a time. Never pull or stretch the hair. At some point you'll be able to use the comb or slicker brush, again starting from the outside and working your way in, to finish brushing out the mat. When you're working on the armpits, it's much easier to use a triangular-shaped slicker brush. Just be careful not to over brush or be too forceful when brushing in this spot. You may elect to gently clip out mats you find here, or in other sensitive places, where the hair loss is not seen. Use your blunt nosed scissors to do this. If you encounter much larger mats or ones that are a real challenge, this is where the mat splitter comes in. Use this tool to carefully slice a large mat into narrower pieces going in the direction of outside to inside. You will find that smaller sections of hair will be less difficult to untangle. Next, get your wide-toothed comb and use it with a picking action to loosen and untangle the hair, before combing it out. If the hair is still damp from the spray, let it dry out first. If you bathed your dog, start separating out some of the worst tangles with your fingers and a brush while the coat is still wet. Put your hand on the mat when you brush so as to avoid pulling or making contact with your dog's skin. When you have most of the bad guys separated, you can begin drying on a low setting, as this will further help loosen the mats while you are combing or brushing. For dogs with long hair, groomers often favor the stripping tool for this type of coat, and you can try your hand at it too. This knife, which has a beveled edge, is helpful in releasing tangles by working on the hair above the mat. Again, use some de-matting spray and after you get the hair loosened up, you can switch to a comb to finish the job. Some people like the sprays containing silicone, which make the hair more slippery, while others use something right off the kitchen shelf that does the same thing: cornstarch. The cause of matted fur isn't always very obvious. However, a dog's coat is much more susceptible to matting when it is in the process of changing to an adult coat. Some dogs' coats are just plain high maintenance and much more vulnerable to the problem. Long, silky, or double coats fall into this category, as do dogs that like to play in the water. Wet hair tends to stick together and before you know it, a mat follows. An often overlooked culprit could be your choice of grooming tools. Inferior brushes and combs can actually damage and weaken a dog's coat, making it far easier to develop a mat. Even your dog's diet or allergies may lead to coat problems. A strong healthy coat relies on sound nutrition to stay in peak condition. Keeping your dog free of mats is, unfortunately, an ongoing task that begins by establishing a foundation of regular grooming habits. Dead hair is a breeding ground for mats. A coat that is brushed and clean stays in better condition and is less likely to develop mats.